It's now April 2009 and I took a review of some fun trips spent with good friends. One thing I've noticed on this report is that no photo credit was given. While I don't call out photos I've taken (the assumption) I try to call attention and give credit to photos that others have taken and given to me. A large bunch of these photos were taken by Luke. The photos with a green date-stamp in the bottom right corner are his. 21 Feb 2001 (Wed) leave Rockford and head up to Houghton / Hancock Michigan (map) with friends Ken & Luke for a snowmobile trip. Weekday trips are more enjoyable as the trails are smoother - weekend traffic causes ruts that can be a bear to ride over. The plan was to ride to the tip and back. We headed east from Houghton / Hancock up and did a counter clockwise trip to the tip. For some reason the GPS was not recording location information so I placed a black hatched line about where we traveled. Coming back into Calument the GPS started tracking and the black line shows our travels. Getting back into town in the afternoon we headed down from town to Mill Mine Junction. At the junction (railroad bed) we headed West looking for Frieda. On the return we went down to Chassel looking for food - none found. Back to Houghton. This turned out to be the longest ride - straight, smooth railroad beds are fast - covering miles in a short time. This loop was another counterclockwise trip. Houghton down to Ontonagon for some snacks. 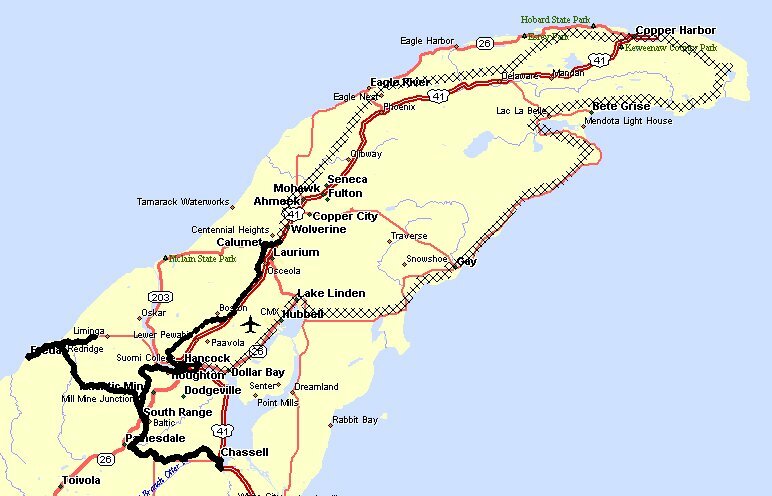 Ontonagon to Bruce Crossing for dinner and head home. Start the day riding to Evert's Arctic Cat to see about working on the clutch in Sue's Cougar. No dice. Bring the Cougar back to the trailer and park it (the loop on this map was clockwise). Hop on Jim's SRV with the broken ski and head up to Calumet / Larium to see the folks at Keweenaw Motor Sports for a used ski. Change it in the lot and head North. Trails are getting too rutty so we headed back South and took a different trail (conditions improved - it was worth the change). Nearing Lake Linden we were looking for a little marked 'club trail' we were told was nicely groomed and rather scenic - we found it. Groomed it wasn't - but the scenic quality was great. We stopped at Dreamland for dinner -- a nice place I'd visit again (good food). Leaving Dreamland we headed back to town and rode about a while by the canal taking pictures and looking at the university. 12v brick battery used - not recharged on the trip. It ran for an additional 12 hours (inside) until it needed recharging.